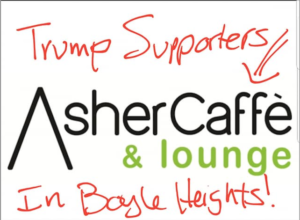 A coalition of community-based organizations that fights against gentrification in Boyle Heights is calling for a boycott of a new kosher bakery and restaurant in the neighborhood, claiming the owner supports president Trump and his anti-immigrant policies. Coalition members announced Thursday they would protest in front of the restaurant starting at 7 pm. The alert included screenshots of various tweets from 2016 and 2017 that were retweeted by Salom’s Twitter account. They appear to show his support for Trump prior to his election and shortly after he took office. Our legal system is broken! “77% of refugees allowed into U.S. since travel reprieve hail from seven suspect countries.” (WT) SO DANGEROUS! The last post currently on the @AsherShalom account is from August –a retweet of a Fox News post claiming that more than one million jobs were added to the U.S. economy since Trump took office last year. 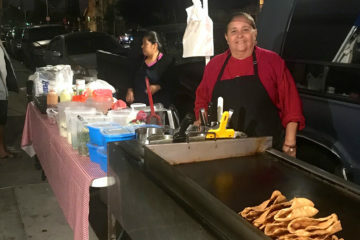 In its Facebook post, Defend Boyle Heights called for a boycott of the restaurant and asked sympathizers to show up at the business at a “special event” planned for Thursday. 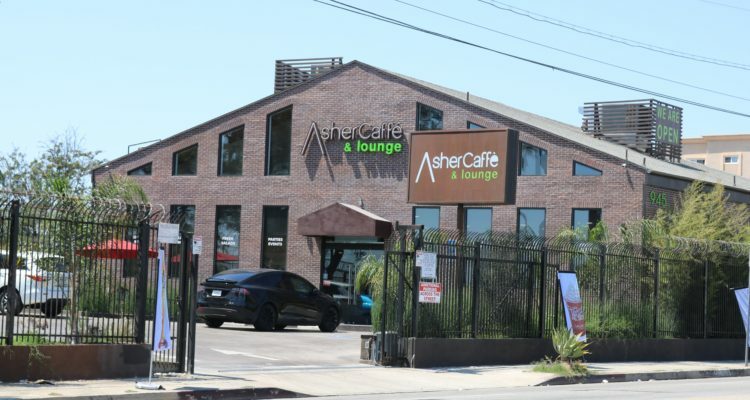 Boyle Heights Beat attempted unsuccessfully to reach Shalom Thursday at the restaurant. A man who identified himself as the general manager confirmed that a “grand opening” was indeed planned for Thursday but would not go into detail, saying he did not have time to speak to a reporter. When asked if he knew about opposition to the business he said: “It’s really a shame that people [in the community] don’t support” a business that hires people of all nationalities. He also said the business serves food to all people without discriminating. The Beat has learned that the Boyle Heights Chamber of Commerce rescinded Shalom’s membership on Tuesday and returned his paid dues. 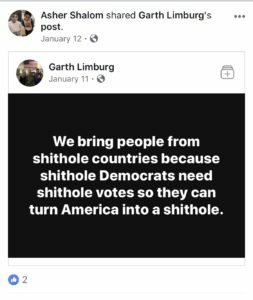 Chamber president Jennifer Lahoda said the action was taken not because of Shalom’s apparent support of Trump, but because of a pair of anti-immigrant posts on the businessman’s Facebook page that chamber members were made aware of. “We rescinded his membership Tuesday because of public statements he made regarding immigrants that are not in line with the chamber’s values and objectives,” Lahoda said. She added the membership would not be participating in Thursday’s opening where it was supposed to provide a “ribbon cutting” ceremony. 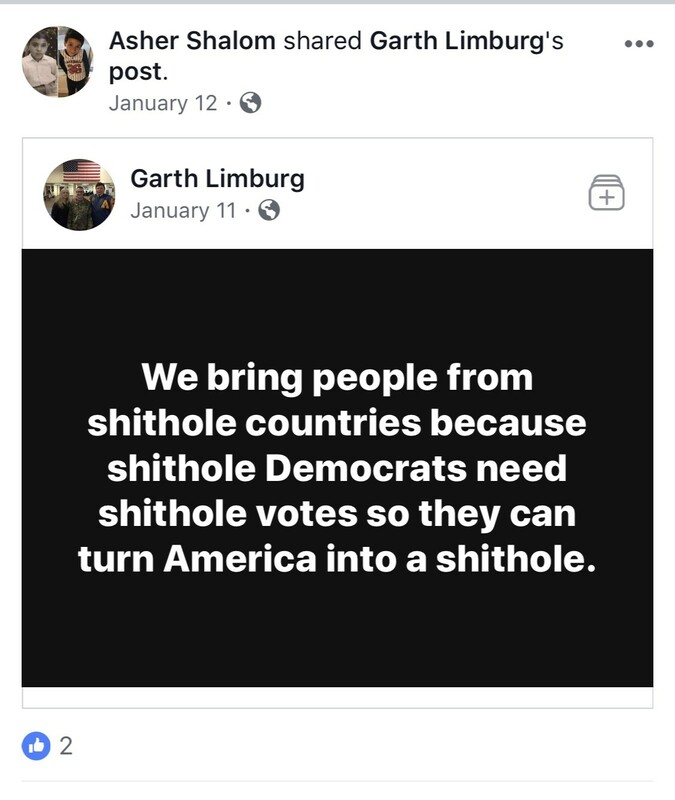 Some anti-immigrant posts, purportedly from Shalom’s Facebook, were also published on Defend Boyle Heights page. Boyle Heights Beat was unable to confirm that they were posted by Shalom. Shalom, who has reportedly spent 40 years in the textile business, is the owner of Asher Fabric Concepts, a fabric and textile distributor. In 2015, the company opened a showroom on Boyle Avenue, directly across from the recently opened eatery. The company reportedly supplies fabrics for the U.S. Olympic team. In June of 2017, Defend Boyle Heights led a protest and boycott of Weird Wave Coffee, calling the operation on César Chávez Avenue a “gentrifying business”. 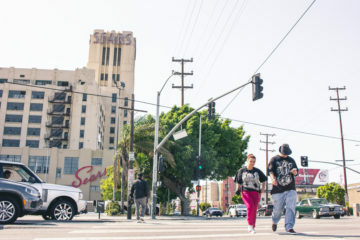 Protesters claimed then that the presence of a craft coffee shop in neighborhoods like Boyle Heights creates an environment where real estate buyers and developers raise rental rates. This post was updated at 5:49 to add comments from Chamber president and Facebook posts. Antonio Mejías-Rentas is a Senior Editor at Boyle Heights Beat, a community newspaper where he mentors teenage journalists. 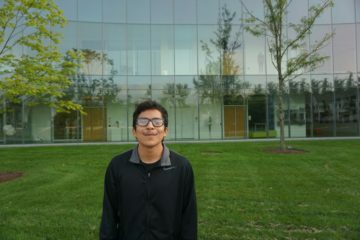 He also manages the organization’s website and covers local issues. He is a veteran bilingual journalist who worked over 25 years at La Opinión, the Los Angeles Spanish-language daily, covering arts and entertainment. As an independent journalist he has been published in the Los Angeles Times, Billboard, Variety, El nuevo día, El país and countless other pubications. He is a longtime member and former board member of the National Association of Hispanic Journalists; he is the past president of the organization’s Los Angeles chapter. A native of Ponce, Puerto Rico, Antonio lives in the eastside neighborhood of Boyle Heights. He tweets @lataino. just passing info….are you aware of the small hole in the wall coffe shop…255 n mission rd…Lucky Wheel coffee…next to Lucky wheels shop…Just saying!! 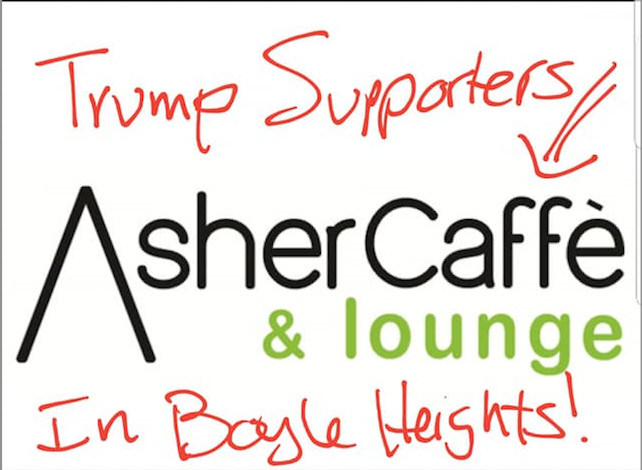 Why is the Asher Caffe being targeted? Ridiculous. Business owners bring good things to a neighborhood and renters get angry that the neighborhood is improving and try to block positive improvements. God forbid that the property owners should experience an increase in the value of their holdings. Holding back improvements for everyone to safeguard your own personal interests is incredibly selfish, but oh, so typically Liberal. Here’s an idea – start your own small business or get together with some friends and buy a property. You’ll be amazed how quickly your point of view changes. It must be a miserable life when you feel like you have to fight against anything that improves the neighborhood you live in. Boyle Heights Beat should hold a forum to educate the community about their misuse of the word gentrification and how the feared displacement alone does not meet the definition of Gentrification. By using intellectually dishonest tactics Defend Boyle Heights is no different then the Trump political machine that uses fear. We’ve edited this comment to delete outside link. We do not allow those. In this case it is a Jewish owner in a neighborhood that used to be Jewish. Thats funny my grandfather is burried in boyle hieghts why is there a Jewish cemetery there? Because it was a Jewish nieghborhood, just like Harlem was, until it became a black nieghborhood, than a Spanish nieghborhood, than a white nieghborhood, and etc, etc, etc, funny how that works sorta like the natural order of things paradigim shift and nieghborhood change or wabisabi. Though has anybody thought of becoming thier gentrifier? La Raza at its best, keep the barrio brown. Gentrification is when taxpayers who pay for the foodstamps and welfare of those who live in the barrios, ghettos or hoods move in and turn shithole neighborhoods into livable places. Old Town Pasadena is the best example of gentrification. You are obviously unfamiliar with the pre- Old Town Pasadena. It was severely degraded. Boyle Heights is a neighborhood with a long history with generations of families. Developers see the area as a land grab who don’t give a rip if the current residents are pushed out. I’ll stand with them rather than make Southern California only for the elite and movie industry employees. 1- East Los Angeles was predominately a Jewish IMMIGRANT community before ‘white flight’ took over and Mexicans and Aztlan Chicanos moved in, rented, some bought homes, and overall regressed it. Take a closer look at the synagogues, who’s buried in those large cemeteries in East Los Angeles, in fact, you’ll find Jewish synagogues in and around Commerce. 2 – Keeping out a Jewish business owner is bigotry, and discrimination. And… anti- immigrant. 3 – One of the most significant Mexican cultural icons is Diego Maria de la Concepcion Juan Nepomuceno Estanislao de la Rivera y Barrientos Acosta y Rodriguez…inhale… AKA Diego Rivera, was part JEWISH. Frida was a NOT Jewish but certainly wanted to be considered one. 4 – I never saw any of you vatos and vatas and your liberal communist comrades, that’s the Diego-Frida connection, ever protest the Jim Crow era like firebombing of Black American families moving into Boyle Heights’ Ramona Gardens. Homies were caught on security camera leaving the scene and the LAPD, or ‘Los Ejercitos De Nuestra Reina Guadalupe De Los Angles’ held a press conference asking for the public’s help. All this was was reported in the local news and Los Angeles Times. You may want to research those stories. Did I mention BOYLE HEIGHTS? And 5… I don’t see you protesting and holding up signs outside a MEXICAN owned Business in East L.A. that has a racist cartoon mural mascot painting nice and large on the exterior of their business. It’s been there now for a while. But yet, you lefties seem to ignore that of course. Bonus – I’m Latino. And trust me, there are many a President Trump supporter within the Latino community that you care to acknowledge. It’s very disturbing to see the near pogrom attacks on this Jewish business. The main culprits can be found on Yelp posting as Mayra H., Danielle C., Rita S., Antonella A. and others. They all match up with Facebook members of this unhinged group.